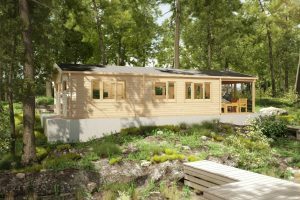 Winter months are traditionally the time when we work out and launch new log cabin models before the spring comes and the new season kicks off. 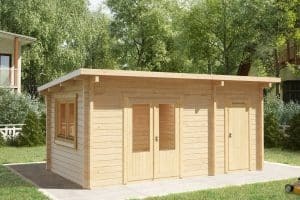 Usually we add 15-20 new garden buildings and log cabins every winter. This winter has been extremely productive and fruitful for us. 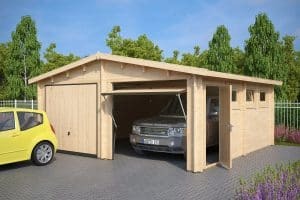 We have managed to develop an entire new range of modern wooden garages, new 92mm “Holiday Line“ large log cabins with brand new German made Roto windows and doors, new range of 70mm garden sauna cabins as well as numerous contemporary garden rooms, summer houses and sheds. 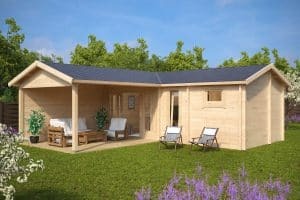 Back in 2015 we decided to be bold and brave and move away from the traditional and ubiquitous garden buildings like all other log cabin suppliers do and develop a brand new modern design and style. This was a complete game changer for us and we are pleased that our sleek and modern designs have been very popular. We will continue this trend for the 2017 season. 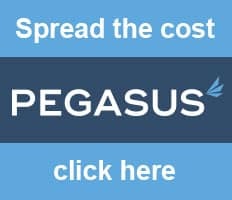 It is no secret that what inspires, encourages and guides us the most is what our customers prefer and demand. 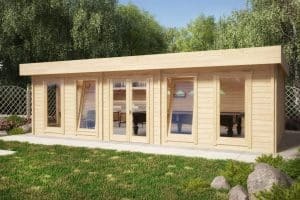 More and more customers have become aware of the impact of wall thcikness, glazing options, flooring as well as other important log cabin features and many of them are willing to pay a higher price for extra luxury, comfort, stability and a longer life span. This is one of the reasons why we saw our biggest increase in sales for us in 2016 came from the large premium garden rooms segment. 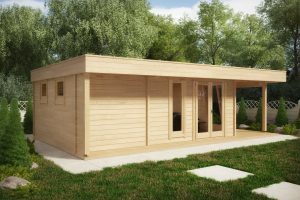 Our new garden rooms come with extra comfort, spaciousness and longivity. 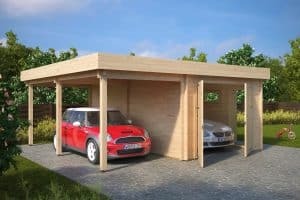 We have used extra thick 70mm walls for more than half of our new garden buildings. 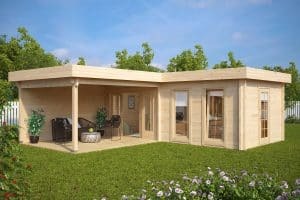 These massive garden rooms do come with a higher price tag, but 2-3 times longer life span and greater strength as well as significantly less impact of the outside weather and temperature are all tangible benefits you will enjoy. 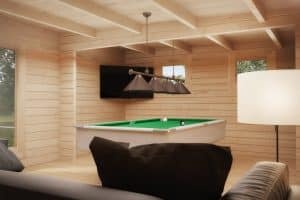 You can find a full size 5 x 8m garden snooker room, large 18-30m2 garden rooms, corner summer houses with sliding doors and large verandas as well as a few garden room and shed combo buildings and double storage sheds among our newest additions. 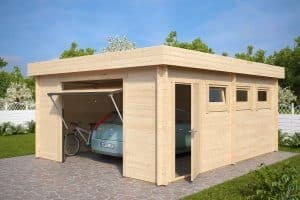 Any one of them comes with double glazed windows, metal rods inserted throughtout the entire wall in four corners for extra strength and at least 44mm wall thickness. 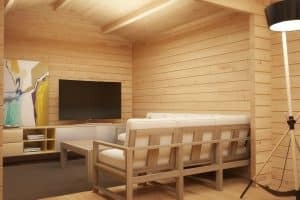 Our newest sauna cabins have been designed for true sauna fans who demand nothing but the best. 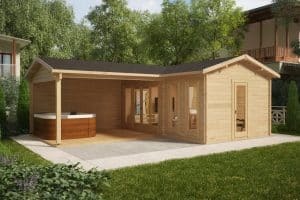 All our new sauna cabins come with 70mm thick walls, shower area, changing room and very generous veranda for cooling down, BBQ cooking or placing a hot tub. 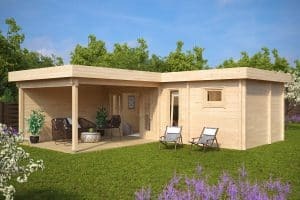 You can create a proper recreational center to relax and socialize in or a SPA and fitness oasis in your garden with our new large and luxurios sauna cabins. 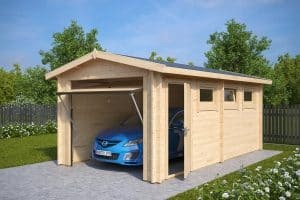 Our new wooden garages are in strict compliance with high Hansa24 standards. 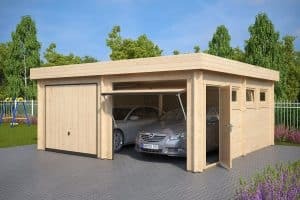 This means that they all have a modern “Hansa“ look to set them apart from hundreds of traditional log cabin garages you can find from other suppliers and offer an extra long life span and stabilty thanks to 44mm wall thickness and strengthening metal rods and storm braces. 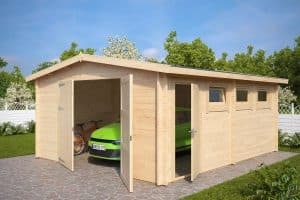 All our “Hansa Line“ garages, double garages and garage and carport combined log cabins have doubled glazed windows in the standard kit. 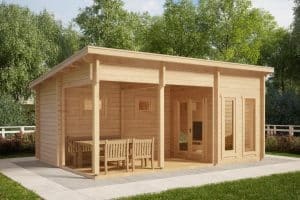 In 2016 we noticed a big increase in one and two bedroom log cabin sales. 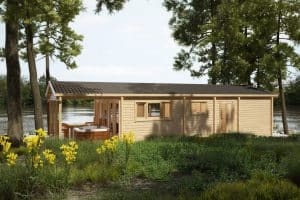 These cabins were widely used as temporary homes while building new homes, renovating an existing one, holiday homes, rental or ancilliary accommodation. 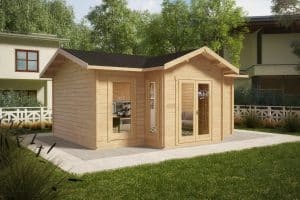 Our new “Hansa Holiday“ 92mm log cabins have been designed for more demanding customers in this large log cabin segment. 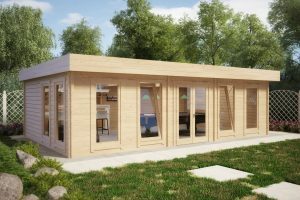 Instead of standard double glazed windows and doors these “Hansa Holiday“ log cabins have German made Roto “Turn & Tilt” windows and doors to maximize comfort for users and offer significantly better thermal insulation. 92mm walls instead of 70mm increase strength, longevity and resistance to outside weather. 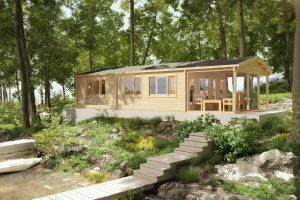 First three log cabins, “Hansa Holiday A”, “Hansa Holiday B” and “Hansa Holiday C” will all be launched before spring 2017 and there are many more to come in the near future.